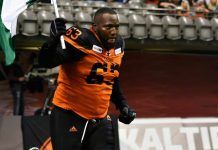 The BC Lions Football Club today announced that international receiver Kevin Elliott is among five new signings including Kenny Lawler, Samajie Grant, Vernon Johnson and Ronnie Holley. Elliott (6’3”, 212) began his CFL career with the Toronto Argonauts where he spent the 2015 season and half of the 2016 campaign appearing in 24 games recording 73 receptions for 936 yards and 10 touchdowns. He also appeared in three games for Hamilton that year adding another 15 catches for 220 yards and a major. He began the 2017 season with Hamilton before being waived and also saw action with Ottawa for one game last September. Lawler (6’2”, 180) was a 2016 seventh-round NFL Draft selection (243rd overall) of the Seattle Seahawks. The Cal-Berkeley grad spent that season on Seattle’s practice roster and attended training camp again in 2017 before being waived as part of the club’s final roster cutdown. Grant (5’9”, 180) enjoyed a productive four-year stay at the University of Arizona piling up 145 receptions for 1,639 yards and 12 touchdowns. As a senior in 2016, he played extensively at running back, exiting Tucson with 491 career rushing yards on 81 attempts with six rushing scores. The California native received a mini-camp invitation from the Detroit Lions last spring. 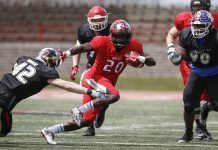 Johnson (6’0”, 195) receives his second invitation to a CFL training camp after a stint in Ottawa last June. The Texas A&M Commerce grad was a undrafted free agent signing of the Detroit Lions in 2015 and also spent a year playing pro ball in Germany with the Wiesbaden Phantoms.